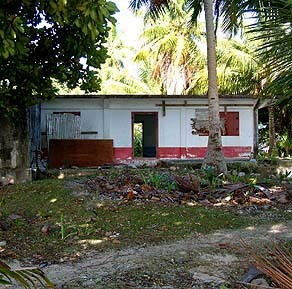 The Women's House, paael, on Fedraey. "The Women’s House is like this," Lourdes explains: "every island, when you go on the island, you can find the house positioned sideways along the shore. That’s the Women’s House. Though now some people build up their houses that way, but that’s not our custom. The homes should be pointing towards the shore. "I don’t know why the Women’s House is oriented that way. 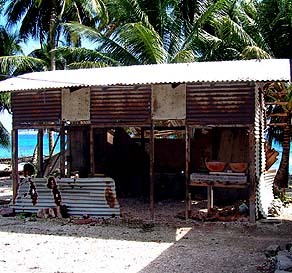 Maybe so that when people come from another island and know the customs of the Women’s House, they can recognize it. When you go to Fedraey you can see it, very close to the water. When you go to Fais, then you can see the house." "Filtey was living here and that boy Yongl'aab grew up as a young man," Stanley says. "Filtey was having the regular period of women, and going to the Women’s House, so she decided that the young man, her son, should have a separate living place. So the Men’s House became her son’s place to live, and where she lived became the Women’s House. "When she needed to get a light, she could walk to the son’s place, the Men’s House, and get a light. Sometimes she took coconut shells and banged them together to attract the son, and the son would hear that and go down and check on what she would need, and he helped her with those. There’s a good association between the Women’s House and Men’s House." 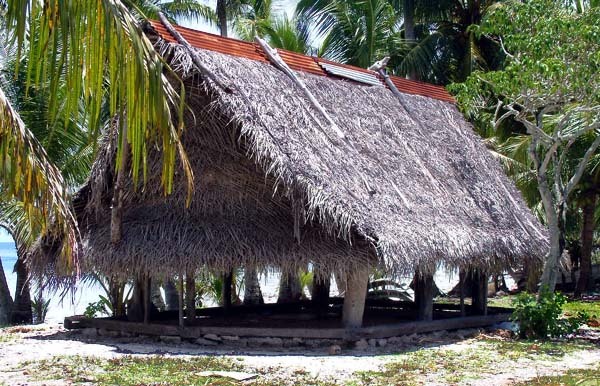 The Women's House on Mogmog sits parallel to the beach. Map after Descantes (1998). 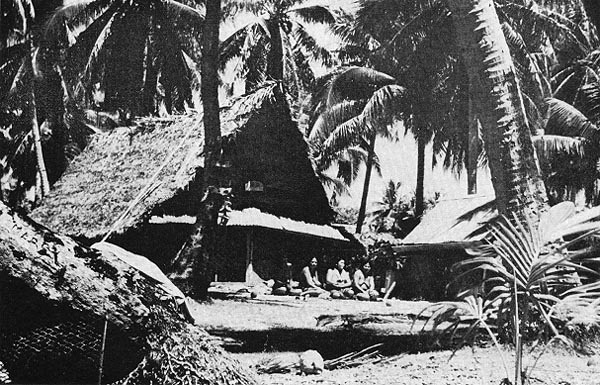 The Asor Women's House is identifiable from the shore by its orientation parallel to the beach. "The Women’s House, when the women have their period, that’s the time they go and stay, until six days later," Lourdes resumes. "They stay there for six days, six nights, doing hard work. 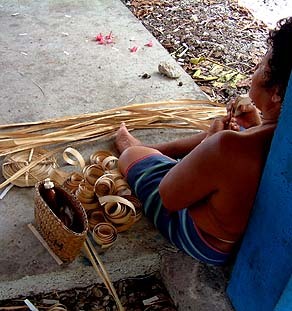 They make baskets and mats and lavalava, only those things they can do in the Women’s House." "Everyone who is having period, they’re supposed to go down there," Hosay adds. "It’s three days that they have their period. And when they stop their period, then they stay there for another three days, I think maybe to make sure that they are clean when they come out." "Meanwhile, they’re not allowed to touch food at their home," Hosay explains, "because that’s where the brother is eating, and we consider them as dirty during that time. If you watch carefully you can tell if a women is staying at home and hiding that she has her period. Because they will not want make the food, while they’re having their period, and have their brother eat it. "Normally when they cook the brother this soup, they stick their hands in the bowl and break down the papaya, coconut, and other ingredients. But while they’re having their period, they won’t do it. They’ll ask somebody to come and do it. So they will make their excuse: ‘Okay, you go ahead’ and tell somebody else to do that. So you will suspect that this is the reason. "When you have your period, you cannot prepare food for men, you just go and stay there at the Women's House," Lourdes concurs. Sqeezing grated coconut with water to make coconut milk for the evening meal. This young woman's knee rests on a coconut-grater stool. 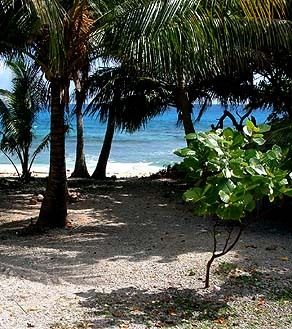 Path to the beach from the Women's House on Mogmog. "The women in the Women’s House, they cannot come up to the entire village to walk around. They have just a certain area by the Women’s House where they stay," Stanley states. “They are not allowed to walk around on the island," Hosay assents. "They just stay in the Women’s House’ or when they go to the end of the island, they just walk on the beach. The Women’s House is always by the sea. "In Fais it’s different. The women having their period, they allow them only on the mangrove, not on the beach. Because if they walk on the beach, they cross the canoe houses and Men’s Houses where, before they go fishing, the men make magic. And it is not good for woman having her period to pass by those places." Women outside a menstrual hut. Photograph from Lessa (1966). "Men are not allowed to go down to the Women’s House. When they stay there, women wear old lavalavas that have holes in them, for when they bleed." Lourdes says, "If somebody stays in the Women’s House and her husband comes to the House for her, the woman go outside and they will talk." “Filtey told the son that he had to turn that place into a platform of all the goods that come to Mogmog,” Cal recounts. “Whoever the dwellers of that place may be, they have to get the first serving of all those goods. So that’s why when there’s a lot of turtle, the first part they separate out to give to the Women’s House first, before they divide up the rest. And all the other things that come to Mogmog also, they put a portion aside for Filtey, for the Women’s House. “To bring the fish to the mother, the son goes out fishing,” Stanley explains, “and when he comes back, he gets ten fish—it has to be ten; they said this is the number of fish that we should give to the Women’s House, practiced from a long time ago. And if two or three canoes going out fishing, each canoe will have to provide ten fish. We learned this practice based on that history, or legend, about Filtey and the son. Not only the fish, but any distribution of things on the island." 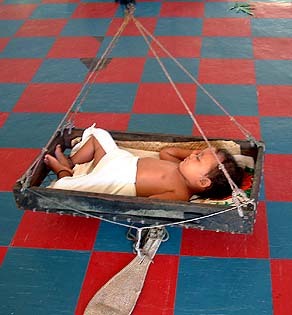 A baby sleep suspended in the Women's House on Mogmog. Below is the backstrap for a lavalava loom. Preparing pandanus for weaving baskets or mats. “If you catch only eleven fish, then we don’t consider that you caught any. That’s still a way within the culture that we do that. If two of you on the canoe come back with 100 fish, that’s enough, you can always provide other people, relatives, neighbors, then you will give that ten. "And you two come back with only twenty fish, that’s when we will say, ‘you didn’t catch any.’ If I come and I witness that you have that many fish, I would say, ‘oh, you come back with no fish.’ So they would be no longer be required to give the fish. “There are certain fish that we should not take to the Women’s House. Those that are taken to taboo platform, we don’t take that over there to Women’s House. 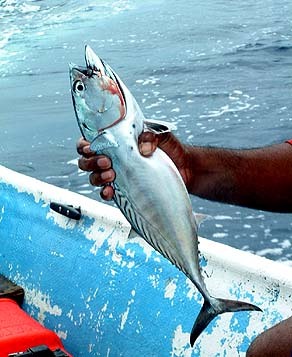 The smaller fish, that are not cut out for that purpose, we can take it to Women’s House. But those bigger ones we don’t. Even now, we don’t do it. "But other types, smaller ones, we collect ten and we take them there. And we do this because this has been practiced from the one that has started all this. So we just continue on doing it. Even now we do that." A cooking shed is located next to the Women's House, for use of the women residing there. "And when a woman is pregnant, that’s where she goes to deliver. There, everything that should be taken care of is attended to by other woman. But just at the Women’s House. Not at home and not elsewhere. Now we have a dispensary, and they put it close to the Women’s House because of that purpose. So when they give birth at the dispensary, they are still in the Women’s House area. “So these things became a practice, and other people later, they knew the rules of a Women’s House. I don’t know how it’s delivered to people later. Maybe some women received in dreams the knowledge of this regulation of the Women’s House, and as other people began to come in, then they learned that these are the Women’s House regulations—what you should and shouldn’t do." “I think these things are all based on the respect. We consider the Women’s House as Women’s place for meeting, but during their period, they stay there. During that time, it’s not right that they should stay around the family and the brothers." Click here to learn about the making of traditional lavalavas. Within the story of the origins of the Women's House also lies an explanation for the origins of the Men's House.